If you want to change the way data appears in a cell, you can rotate the font angle, or change the data alignment. Select a column, or row. Select Align Left, Center, or Align Right. Select Top Align, Middle Align, or Bottom Align. Click a cell, or press Ctrl + A to select all cells. 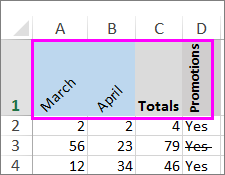 Select a cell, row, column, or a range. Click Orientation, and then select an option. You can rotate your text up, down, clockwise, or counterclockwise, or align text vertically.